Tom Wilson has grown into one of the Capitals' most important players and is the heartbeat of the team. His biggest challenge now is trying to stay on the ice. WASHINGTON — Some of Tom Wilson’s teammates can’t help themselves. After seeing Wilson play some of the best hockey of his career this season, they are liberally tossing out comparisons to Hall of Famers. The verbal bouquets don’t stop there. “His presence on the ice, he’s one of those Mark Messier, Jarome Iginla-type guys,” said defenseman Madison Bowey. There is no denying that the Capitals have been vastly improved since Wilson’s season debut on Nov. 13. The Caps entered that game with a modest 7-6-3 record after Wilson missed the start of the year due to a suspension. Two nights later, Wilson returned and the Capitals have since won eight of 11 games. Wilson has eight goals and 14 points over the 11-game stretch. He has also been a fixture on both special teams’ units and recently scored in a career-high six consecutive games. 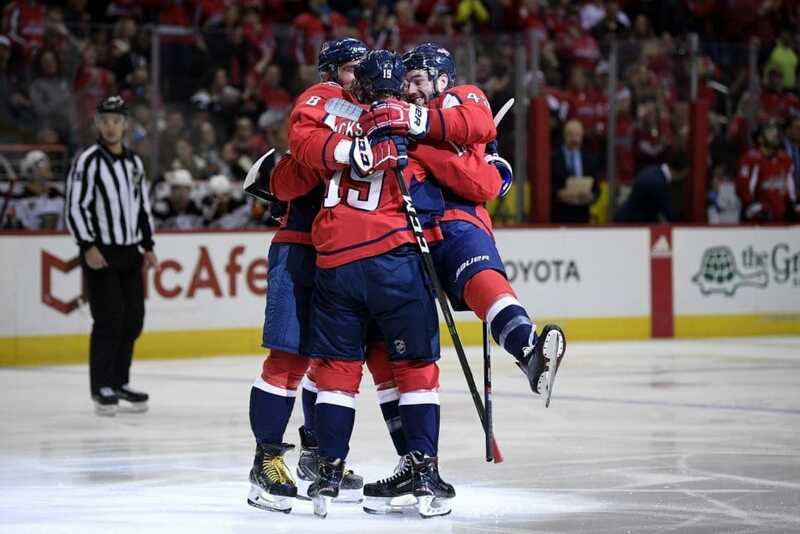 The Capitals could be missing that presence again when they visit the Arizona Coyotes on Thursday (9 p.m.; WFED 1500AM). Wilson suffered an upper-body injury against Vegas on Tuesday and did not return. Filling the void when Wilson was out to start the year proved a challenge. Just ask head coach Todd Reirden, who went through a revolving door of top-line right wingers with Wilson unavailable for the first six weeks of the season. By early November, five different players had been given a shot to skate alongside Ovechkin and Evgeny Kuznetsov in Wilson’s stead. While each of the five wingers showed flashes, none could check all of the boxes that the versatile Wilson brings to the lineup. “Those can be big skates to fill,” said Devante Smith-Pelly, who made a brief cameo appearance on the top line when Wilson was out. Wilson is a rare talent. The 6’4”, 218-pound winger possesses a unique blend of speed and strength, along with defensive savvy and the ability to finish offensively. He is also incredibly popular among his teammates and is frequently lauded for his leadership. It is widely believed he will soon have a letter stitched on his sweater and that he could one day succeed Ovechkin as the Capitals’ captain. 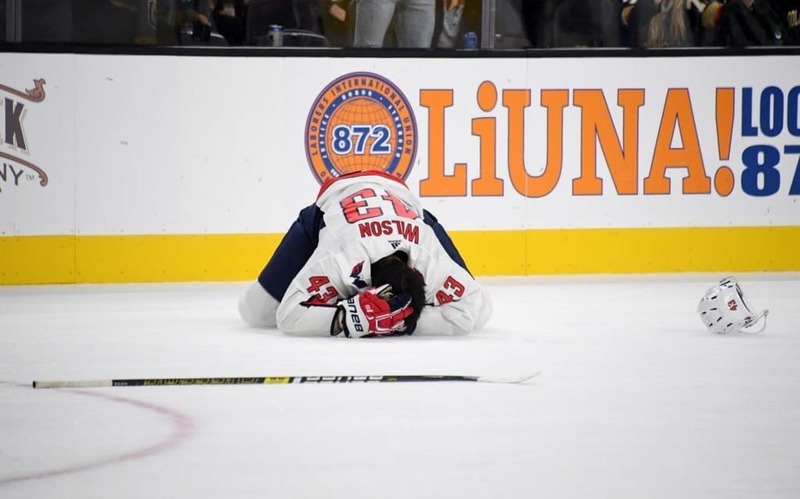 The Caps finally won a title, but that’s not the only thing D.C. sports fans can be thankful for this year. The WTOP Sports staff shares their picks. While the Capitals are loaded with high-end talent in Ovechkin, Nicklas Backstrom and Kuznetsov, Wilson provides a blue-collar, physical element that few on the team can replicate. He has learned, over the years, how to use that strength not just to deliver bone-crunching hits — more on that in a moment — but to create space for his teammates and to win puck battles along the boards and below the goal line. Wilson is constantly evolving. As a 19-year-old rookie, he was as a fourth-line grinder on a team that missed the playoffs. Four years later, he emerged as a key cog on the first line for the Stanley Cup Champions. Along the way, Wilson has made adjustments that have allowed him to move up the depth chart. He’s emphasized speed and conditioning during his offseason training so he could play top-line minutes without tiring. He’s worked privately with skills coaches to help fulfill his offensive potential. Two years ago, he began penalty killing. This year, he’s also been on the power play. While Wilson’s on-ice maturation has been gradual, the Capitals have long felt they had a unique talent. That’s why they were comfortable handing him a six-year, $31 million contract last summer. The commitment to a player that has yet to hit 20 goals or 50 points in a season raised a few eyebrows, but internally the Capitals believed that Wilson would continue to evolve and reach another level. If Ovechkin and Backstrom are the faces of the franchise, Wilson, it’s been said, is the heartbeat. He’s shown an ability to provide a jolt for the entire team, as evidenced by his mid-November return in a 5-2 win in Minnesota. By the end of the first period, he already had his first goal of the season after driving to the net and scoring from atop the crease. By the end of the second period, he had his first fighting major. By the end of the third, the Capitals had earned two points against the Wild. It was quintessential Wilson. 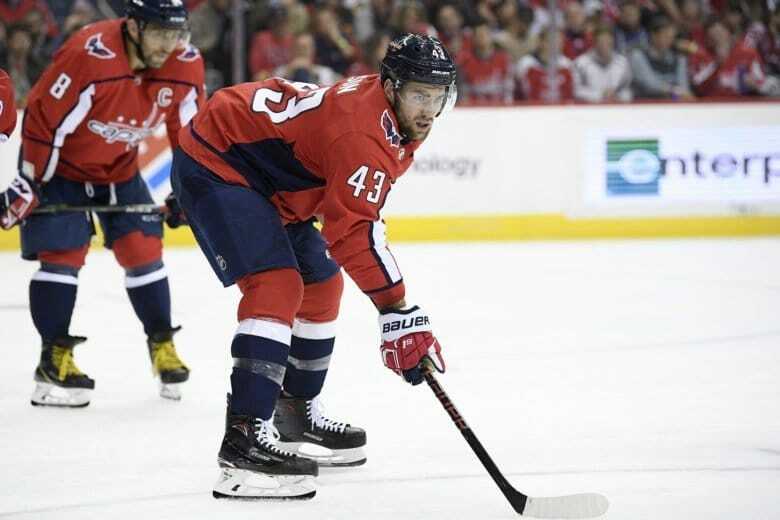 “He’s a big-bodied guy that nobody likes to play against,” said Capitals assistant coach Scott Arniel, who saw plenty of Wilson during his five years as an assistant coach with the Rangers. Because this is already Wilson’s sixth full NHL season, it’s easy to forget that he’s still only 24 years old. His game continues to grow, along with his ice time and responsibilities. Despite leaving two games prematurely this season — once due to a match penalty and once due to injury — Wilson is averaging 19 minutes and 34 seconds of ice time per game. That is more than three and a half minutes north of the 15:59 he averaged per game last season. Wilson was on the top line throughout last spring’s Stanley Cup run, proving tremendously valuable with five goals and 15 points in 21 games. In addition to finding a home on the No. 1 line, Wilson also emerged as a key cog on the Capitals’ penalty killing unit. The Capitals PK has seen a big improvement since Wilson returned. Washington went 43-for-60 (71 percent) in short-handed situations before Wilson returned; the PK is 34-for-41 (83 percent) since. And therein lays the next step in Wilson’s evolution. Wilson has been suspended four times since September 2017. Although his most recent suspension was reduced from 20 games to 14, it was a clear message that Wilson needs to reign in it. It’s a delicate balance for a power forward who can do a lot of things well, but can deliver punishing hits better than most. The consensus around the Capitals is that Wilson can still be physical and deliver hits when appropriate, but he needs to be smarter when it comes to picking his spots. “Unfortunately now, there’s a lot of attention on the physical play, but he adds a lot of different things to our team,” Reirden said. “Maybe if he’s not quite as physical in times of risk, I don’t think it’s going to hurt his overall production and definitely not hurt our overall team because he can do a number of things to help our club. 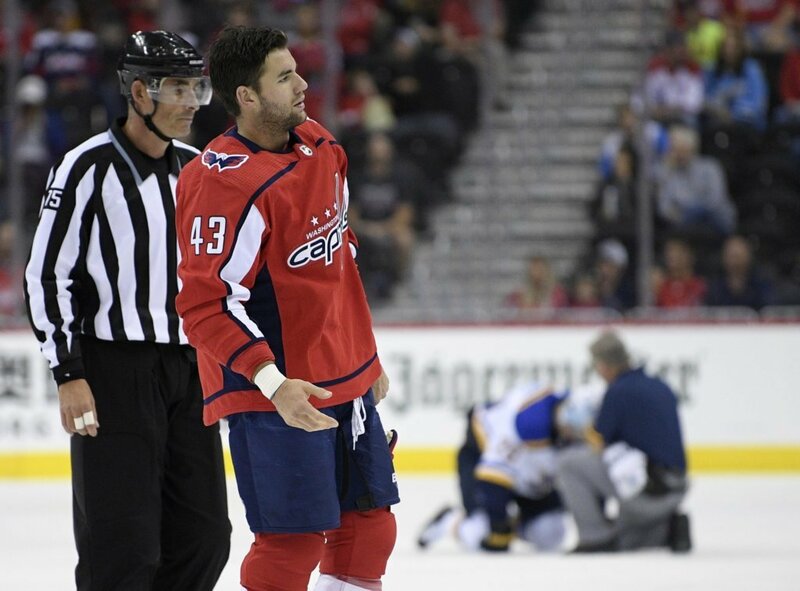 Wilson has made a cognizant effort to ease up in some instances if an opponent is in a vulnerable position, but as evidenced by his hit on New Jersey’s Brett Seney last Friday, which resulted in a five-minute major penalty and an ejection, Wilson isn’t likely to receive the benefit of the doubt. According to Ovechkin, Wilson’s physical game is welcome, but his all-around game has become increasingly valuable. As he finds that balance, Wilson also appreciates the importance of simply remaining in the lineup each game.